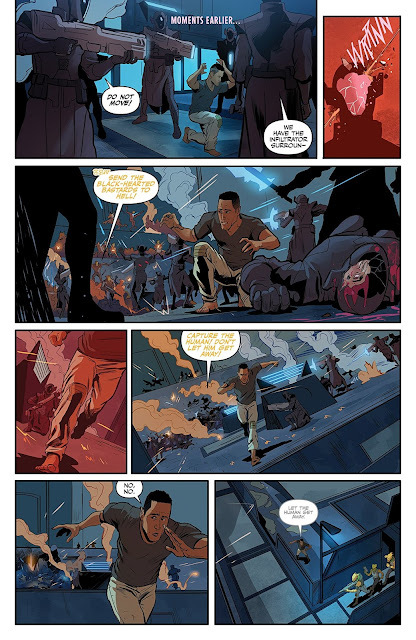 One of the best times I had at San Diego Comic-Con this past July was sitting down and speaking with Adrian Wassel, Editor-in-Chief of Vault Comics. (His brother, Damian is the Publisher, which means he's the one who rants about Spider-Man while Adrian points out all the good he does for the city, as I understand things. Which is especially weird because they don't even put out superhero comics.) Vault is a family-run business, and it's clear when you stop by their table that everyone working there, even if they aren't related, are close-knit like any good small company. While I was at the Vault booth, the others were all busy talking with creators (both in the Vault orbit, like Mike Moreci, and others who stopped by) or hand-selling books with enthusiasm. It was a great atmosphere to be around. 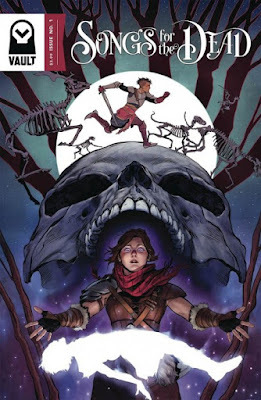 Vault's been around since 2016, but they run like a group of con and publishing vets. When you hear Adrian talk about the company, their plans, and the direct market/retailer connections, you clearly see that they really know what they're doing. It shows in the quality of the books, both in terms of their printing and the plots. He's also a lot of fun to interview, as you'll see from the number of times I've indicated we started laughing. Without further ado, here's our interview! Rob McMonigal: How did you guys decide that you wanted to be a comics publisher? Adrian Wassel: *laughs* The answer to that question is both long and short. The short answer is we always wanted to make comics. We made them in our notebooks as kids. The desire was always there. The long answer involves us all growing up and going to school for various things and actually coming back together and making a comic—my brother, my cousin Nathan, and I—years ago. Barely finished the thing. Printed it. Got the box. Cut it open and we were like, “Now what do we do?” So we went to a comic convention—we went to APE—I don’t even think that’s a thing anymore? Adrian: Yeah. We went there, and the reception was great — it was a weird comic about a wolf,mostly silent—and from there we met a ton of friends, did the Con circuit. Saw there were all these incredible stories with incredible creators that weren’t being greenlit elsewhere and we thought, “Man we can do something with these. We can publish them.” And we ended up pursuing it genuinely and we managed to find funding and we approached those creators who were friends and asked them if they wanted to come on board, even though we didn’t have a logo yet, and they said yes! And then we launched and our gameplan from the beginning was sci-fi and fantasy—we were all sci fi and fantasy nerds. Rob: Once you got yourself established as a publisher, how hard was it to get into the direct market? Adrian: Very difficult. The thing that we did well from the beginning that helped was that we established very strong relationships with a few retailers and they really championed our books. Not just to their customers but to other retailers. Without those retailers who were with us from the beginning, none of this would have been possible. 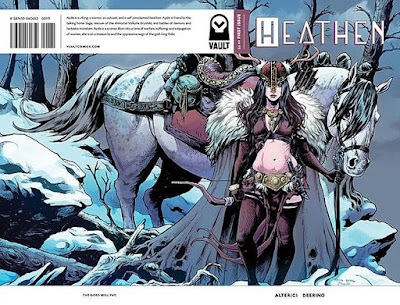 We have 18 series out in 18 months—that acknowledgment of the direct market only happened because of the retailers who helped us convince other retailers to stock our books and now we keep getting help from those same retailers who assist us in spreading the word [about Vault comics]. Rob: The production value on your single issues is really distinctive. There’s something about the look and feel of these comics. When I went to Emerald City Comic Con and picked some up, the thing I kept coming back to was not just the quality of the stories, but the quality of the physical property of the issues. I’m assuming that’s an intentional choice? Adrian: Yes, absolutely intentional. All credit goes to Tim Daniel, who does all of our design and branding and my brother Damian, our publisher. Tim does the design across all our titles from logo to cover template to guiding the aesthetic [of our books] and Damien is always involved with the printers, figuring out how, in a cost-effective way, we can maintain our standard of print quality. Together, their efforts have elevated our whole brand and given people the impression that we really care about our books. And we do. We wanted all of our fan who pick up one or two or more of our titles to think, “I’ll add this.” Because even if the comic falls flat [for them], they’ll know the people publishing the book cared about it. That the physicality of the book is important, too. Rob: I know you talked about this at your ECCC panel, but I wanted to ask you about your line and the idea of maintaining a smaller amount of books so you can keep that quality control and not being worried about things slipping through the cracks due to there being too many comics to keep up with? Adrian: Yes, no matter how large we ever grow, we will always maintain a cohesive and curated catalog. Pardon the alliteration there. We always want to balance sci fi and fantasy, those are our pillars. But we also want to represent the myriad of sub-genres of those banners, whether it’s something that everyone knows like Sword and Sorcery or whether it’s fun and new like bio punk. I wanna be the place where creators can bring those stories and they will be serviced and fans will find [the comics] approachable. And yeah, it helps with what we talked about above in terms of the look of our books. Tim and I are on the same wavelength, thinking about the tangible quality of our brand, looking at the catalog and think about how it looks visually. Rob: I don’t know when that started but—STOP! Adrian: That makes two of us. Rob: But the idea that the covers really do make you stand out and take notice—they boil down to their essential elements, as you said—but it’s also telling me what’s going on. Adrian: I’m very glad that’s been your reaction, and I’ve heard that from a number of fans. It’s Tim’s influence, but it’s also the creator we work with. We design a cover template and they get to play with that design and do whatever they want. We want to engage the reader and hook them with the cover, but also show a bit of the story. We’ve had some really cool variant cover lines. We’ve done the women in front cover line, which every one of our single issues in 2018 has or will feature a cover by a team of women creators. We’ve also started the Vault vintage covers, which are homages to some of our favorite covers. It’s been a fun way to let creators explore and do homages to their favorite covers and creators from the past. Yeah, I think even our variant lines have a purpose just beyond just upholding the Vault brand. Rob: In terms of things, it seems like we are seeing a small resurgence in smaller direct publishers that are forming their own identity but not trying necessarily to poach from each other distinctive thing. Why are we starting to see that now? Why the other publishers, as opposed to just more Image books, as we may have seen a few years ago? Rob: Of course, in the broad sense, everyone is competing. There’s only so much money. Rob: But it’s not like I look and think, “Oh these Aftershock books are exactly like what Vault has. Or that these Lion Forge books are exactly like what Aftershock has. Rob: It’s like all of you guys have this own thing that you’re doing. Adrian: A distinct style. A distinct tone. Rob: Right. And it seems like we hadn’t seen that for awhile. Adrian: Yeah. I really have to say I think it’s been maybe because of publishers like Vault popping up. But I think it’s mostly because of creators going and finding the right home for their books. Seeing that this book fits within that tone [of the publisher.] And then readers and shops really appreciate that. One of the things I don’t think gets talked about enough is that it’s really helpful for retailers to be able to know what a publisher does. They only have so much shelf space, so it’s helpful if they decide they really want another fantasy title or another sci fi title or perhaps they want that punk aesthetic that Black Mask has. For shops, it’s super helpful that they don’t have to sort through the whole [Diamond] catalog to review every title to know that I’m getting a sci fi book. I can go right to Vault. Or Lion Forge, or Aftershock or Black Mask. When they get to our part of the catalog, they know what kinds of books we all publish and they can find the right fit. I think part of it is the new wave of shops coming into the market. I know there’s been panic about shops closing up but there’s also been a lot of great shops opening. And I know those shops are very much in tune with newer publishers like Vault and are in touch on social media and know what they’re stocking. It helps them get through that massive phone book of Previews. It also helps when they give us feedback about what is working, what’s selling for them. Rob: It’s really interesting, because in Portland, there’s at least five shops I can go to easily, and they each cater to their own audience. I feel bad that I can’t spend money all the time at all five! Adrian: Those retailers interface every day with their customers and they know their customers. Any good retailer is picking very carefully the titles they want to present to their customer base. They know and can say, “Hey Steve, check this out!” or “Hey Stacy, check this out!” and we are able to communicate with those retailers so easily now. It becomes very much a conversations between retailers and publishers, especially at our size. Rob: The days of the dank comic shop are over. Adrian: Yes. I’ve seen a few, and I’m really genuinely excited to see that these newer waves of shops are coming in and the older shops that grow because they understand the market and interface with their customers every day. To return to my earlier point, the key for us as a publisher is that we stay in our niche, which is sci fi and fantasy. We are strongly dedicated to representation, in our books, our characters, and creative teams. The shops know what to expect from us and what they’ll get when they unbox on Tuesday. Rob: That’s what good retailers do—know their audience. That’s what good small publishers do, too, and if not, they just go away. Adrian: Yeah, absolutely. It’s impossible for Vault to come out of the gates and we’re going to step on other publisher’s turfs. We aren’t here to do that. It was never the plan. We want a very clear brand for retailers. 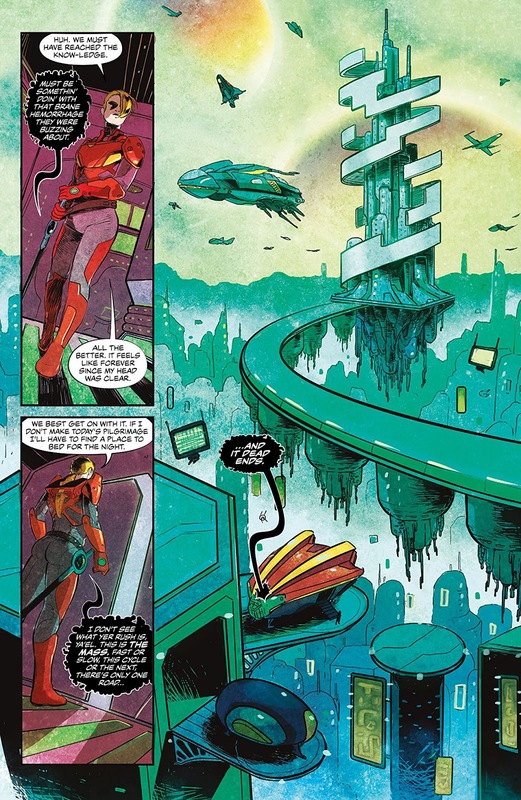 And if we do that well, and the creators continues to make the kind of amazing books they’ve been making with us, then yeah, over time, we end up on the same shelves as those established publishers. It hasn’t even taken us that long to get there. We’ve been doing this for 18 months and our sale continue to improve and we continue to grow. Thanks to the support of our initial retailers and readers and great creators, we’ve been able to do this. Adrian: Thanks and thanks for helping spread the word about Vault comics. 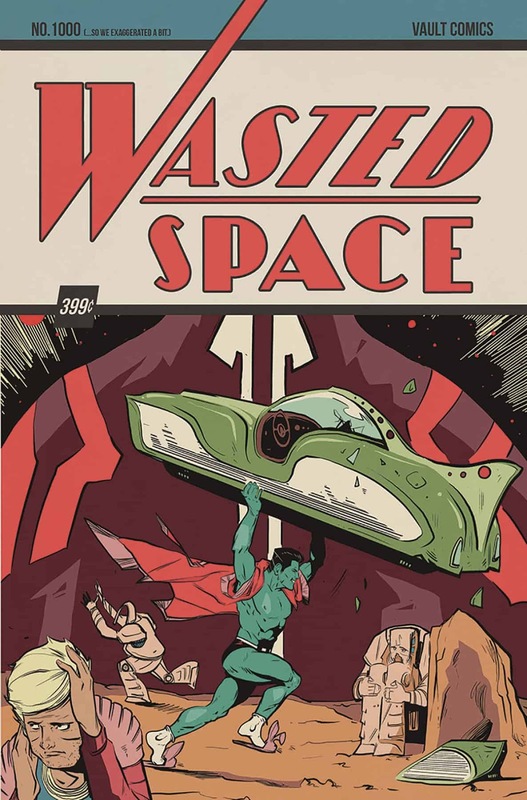 Vault Week continues later today with James' review of Wasted Space Volume 1!